Barcelona and Real Madrid could play league games abroad after La Liga officials said they "support the idea" of matches being played outside Spain. The Premier League has shelved the idea of a '39th game' to be played outside England, first raised in 2008, after criticism from fans and media. Despite one major promoter saying the move "will happen", the Premier League has no plans to resurrect the idea. But a La Liga spokesman said it wants "to grow the international appeal". 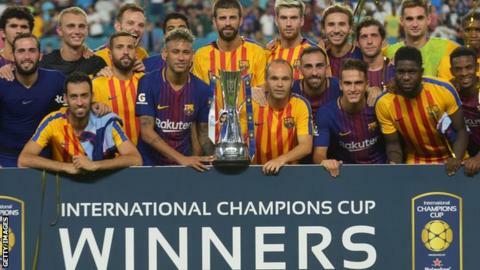 The discussions, which are still in the early stages, follow a summer when Barcelona played Real Madrid as part of the International Champions Cup pre-season tournament. It was only the second time the clubs had met outside Spain and attracted a capacity crowd in excess of 66,000 at the Hard Rock Stadium in Miami. La Liga is trying to find ways of closing the commercial gap between their organisation and the Premier League and feel taking matches outside Spain may bring in additional income from overseas markets. The spokesman added: "Last season more than 2.5 billion people around the world tuned in to watch La Liga. "Clearly, La Liga is global entertainment and we want to grow its international appeal. "As part of that effort we are discussing the option of playing some of the league matches outside of Spain." While the idea has been supported by officials in Spain, there is "no plan to do it" in the Premier League, according to the league's chairman, Richard Scudamore. Speaking in July, Scudamore said: "I may be at the Premier League for five, 10, 15 or 20 years. There is no plan to do it. "Is there still a burning desire? The clubs would like to do it but we are also realistic that says until the fan, political and media reaction is any more warm towards it, it won't happen. "If it did happen it wouldn't be a 39th game. I think there would be a desire to do a round of fixtures internationally but there is no prospect of it happening any time soon or in anybody's realistic timeframe." Charlie Stillitano is chairman of Relevent Sports, the US company that has put together and promoted, the International Champions Cup. This summer, more than 900,000 fans attended a total of 18 games in three countries featuring 16 major European teams, including Manchester United, Manchester City, Chelsea, Arsenal and Tottenham from the Premier League. German side Bayern Munich, big-spending French club Paris St-Germain and Italian team Juventus and Inter Milan were also involved. Plans are already being put in place for next summer's competition and, speaking to BBC Sport in July, Stillitano said there was a market for English football overseas despite the intense hostility towards the idea. He said: "I personally believe it will happen because the Premier League is the one league that can rival the NFL and has really capitalised on its international success. "Let's face it, England is only going to be 50-60 million people. It is never going to be 400 million. "It has to go outside to grow their fan base."